Fleece Belly Bands / Undercoat. 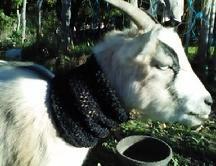 Neck Sleeves to keep more body heat in. Both work great with the insulated coats. 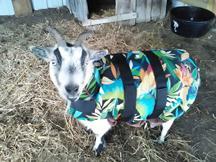 Not recommended for male goats. 1 - 2 coats approximately $28 economy shipping (2-3 weeks). $42 for International Priority (10-14 days). International orders will be invoiced separately for the extra shipping charges. 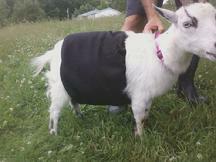 We have a wonderful assortment of Goat Coats. and they can also keep your pet from scratching themselves. Please call or email us if you have trouble ordering. Clara in a size 26. Keep your babies warm in any season. 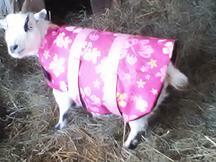 We have coats for Spring & Fall and Winter, indoor and outdoor. There is a great variety of sizes and colors to fit everyone. 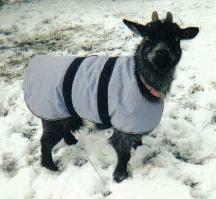 These custom coats are made with quality materials and will last for years. You and your pet will be pleased!